﻿ Swift Elegance 580 caravan review - style and quality prevail! Plus, with so much that’s new in bodywork construction features and techniques, it’s rightly organised a whole series of workshops, explaining all to the likes of Caravan Guard…as well as dealers’ service centres etc. 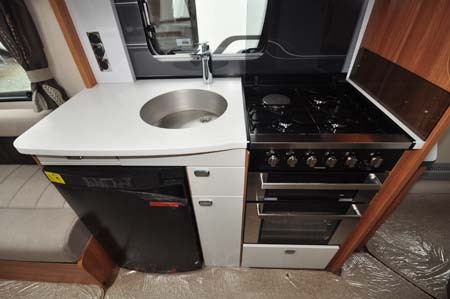 Some five years in the proving, it boils down to a double GRP-skin, wood-free construction with Styrofoam insulation and some neat interlinking, with particular emphasis on a floor that can stand up to the rigours of the caravanning lifestyle. It looks all the better, too, with the slightest of curvatures to the sides and – despite a traditional enough looking three-window front – there’s quite a lot of aerodynamics going on here, too. It’s the new four-model Elegance range (and its Sterling Continental stablemates, if you want an even more radical interior treatment) that’s the first to see the SMART HT benefits, with the 580 here offering an island bed configuration that will appeal to two who want absolute luxury on tour, with the facility to cater for four if and when necessary. Of course, all of this SMART talk would be superfluous if the interior can’t keep up. Subtle changes to the way it builds its furniture has seen an evolution in terms of lighter but stronger fixtures. Drawers and lockers have a good, solid feel to them as well as a soft-close mechanism. Furniture finish varies throughout as you move back from lounge to kitchen to bedroom to washroom – the kitchen, for example, has a quality granite-effect worktop (plus extension) with inset stainless steel sink (there’s an add-on drainer). There are also quality plastic mouldings throughout. Needless to say, specification is high. There’s Alde’s central heating and hot water system, while cooking appliances extend to a dual-fuel hob with separate grill and oven plus microwave. Smaller, neater touches also include the USB socket in the lounge, in addition to the usual 12V and 230V offerings. It’s the 580’s sliding island bed that takes centre stage here, allowing you to create a private bedroom with full en suite facilities care of the full-width end washroom. Slightly at odds to the rest of the surroundings, it’s a rather traditional concertina-style divider for the bedroom, but the bed itself – extending out to 1.82m (but still leaving space for your feet to hang over a few inches) and with a more generous, fixed 1.33m width – on a superior Duvalay mattress. Also here are two wardrobes, not forgetting loads of storage accessed easily enough by hinging up the bed frame. Beyond the bedroom, the rear washroom has sliding door access, although it is still slightly restrictive. 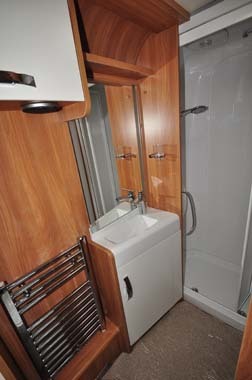 It offers a swivel-bowl toilet just inside the doorway and a separate shower cubicle in the rear nearside corner, with washbasin in between and a generous amount of storage. Changing room space is OK, too. Details throughout have certainly not been forgotten. The locker door hinges have plastic covers (it prevents any hint of lubricant dropping and spoiling the rest of the decor, as well as simply looking neater). The fit of the furniture is exemplary. There’s a corner vanity unit in the bedroom that will also prove perfect for watching TV from bed. Criticism can really only be limited to questions like: Are the front grab handles set too high? Are the speakers too close together in the washroom (and would they not be better in the bedroom, anyway)? It perhaps goes without saying that weights are not exactly low – yet. Swift has kept SMART HT to its top-line Swift and Sterling (Continental) models for now, but there’s every reason to expect it will be introduced to the rest of its portfolio over the coming seasons. It’s not just about making a better caravan for the UK. With its Elegance range, Swift has sent out a warning shot across all of Europe. Meet the best, the very best. 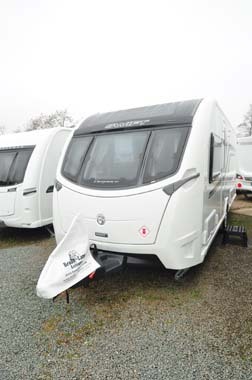 There’s more information on the Elegance range on the Swift Group website and to find out more about our low-cost premiums visit the caravan insurance discounts page. Hi Graham, have you tried signing up to Swift Talk – http://www.swift-talk.co.uk? We picked up our new swift Elegance on the 11th July, & the next day went to Cornwall for a week. My husband said it towed very well. We were both very excited in getting to know it. When the bed is pulled out their is very little room to walk round, if you don’t want to climbe over your partner. The bathroom sink is far to small. (The smallest I have seen in a 4berth van). Their is plenty of room to make it bigger. Then the over head cubards, they aren’t very deep, so it was a struggle to get our clothes & things in. We will get the hang of it & enjoy it for many years to come. Thanks for sharing your experience of the Swift Elegance Mrs Ullmer. I hope you continue to enjoy it! Alas no word from Swift whether in this latest form they’ve managed to overcome the loud cracking noises that have plagued certain examples of the previous incarnation of (in particular) Challenger ranges, and whether this new construction technique has been developed to overcome this disturbing and distressing symptom experienced by many unhappy owners. 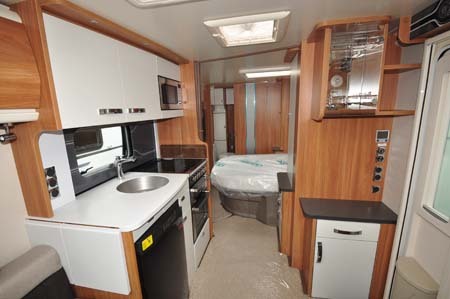 Love everything about this Caravan, (including the adjustable bed) just hate the price! 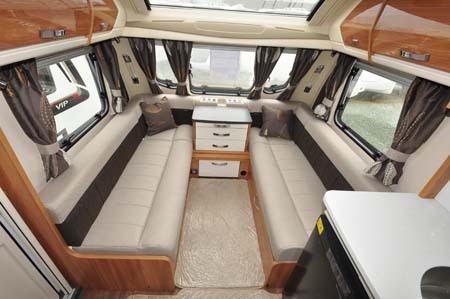 At the moment we own a 2010 challenger 580,lovely caravan. We are not convinced the bed is a good idea on the new layout, when it is made up for sleeping there is no room to get round the end so as in a side bed someone has to climb over. But at least you get an end bathroom, not for us though. Please note that if you go past the end of the bed whilst facing the outside, you will find it very east to get past. Doing it facing the bed makes it very difficult. What a shame William! Hopefully you’ve got everything sorted now and you’re back enjoying touring in time for summer. Does this one leak too ? ……..
Its lovely and stylish but fixed beds don’t work for me why should our 9yr old son go to bed on the lovely deep mattress as we want to stay up later so would have to convert the beds for us. for me they need to think of some different lay outs to make it work with this in mind. – hard to think of how to make this work as every ones needs are different and every family set up is different. Thanks for the great feedback Amanda, I guess flexibility is of up-most importance to a family. No mention of the single piece entry door. All caravans we’ve owned have had stable doors. Why has the door changed ? Hi Paul – I guess that’s a question for Swift. I’ll do some digging and get back to you. Is it that caravanners as a type don’t like sharing a bed with their partners or perhaps they are all so big that only one can fit in a 4ft 4″ bed? Hands up all couples who sleep at home with their partner in a 4ft 6″ bed or smaller. We have a super kingsize, which is 6feet wide. Years ago we had a 5ft double. 4ft 4″ hardly leaves room for someone to turn and goodness knows how you would manage if the dog likes to share! LOL! Until a manufacturer offers at least a 5ft. wide fixed double, I doubt we will consider others. 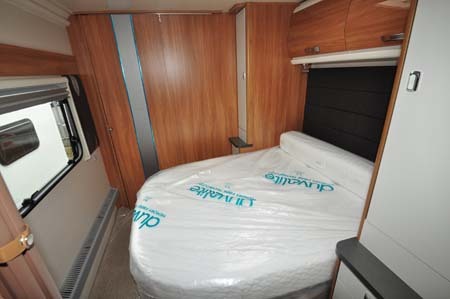 Our Adria Adora 642UP gives us a fixed double, which is 5ft 4″ wide. THAT, friends, is luxury. 4ft 4” is penury. Our Adria’s wide bed is achieved by pushing the two 2ft 8″ fixed singles together, bolting and strapping them in place with the integral fittings designed for the purpose and voila! Apart from that, the Swift looks good but if we can’t get a good night’s sleep, we’re not interested!